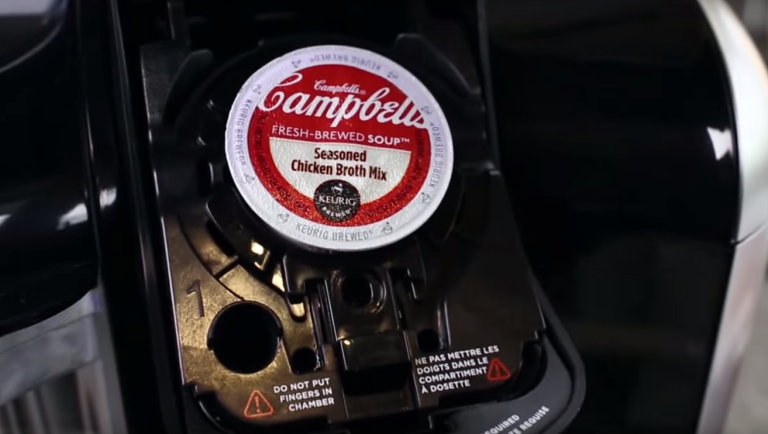 Certain coffee pod machine owners are now able to brew soup from the very same machine. Fans of cup-a-soup and Pot Noodles listen in, for your mind is about to be blown by a coffee machine and pod system. Keurig, the purveyor of pod coffee machines, is teaming up with Campbell's to bring Fresh-Brewed Soup to the same machine that brews your daily coffee with sales already underway on the other side of the pond. To kick things off, Campbell's is offering two different varieties in the shape of Homestyle Chicken Broth & Noodle soup and Southwest Style Chicken Broth & Noodle soup and there is a certain knack to brewing your very own soup. The dried noodles aren't actually inside the pod and instead you empty a sachet into your cup before inserting the pod into the machine and pressing the brew button. Within seconds a mug full of soup that closely resembles a cup-a-soup will be yours. Just remember to let it stand for two-to-three minutes before serving. The soup pods are sold in similar eight-cup packs to coffee pods and come in at $11.99 (£7.77) for a box, which equates to around $1.50 (97p) each. Compare that to a tin of soup and it doesn't feel like the best deal on the planet, however, the cup system is incredibly convenient and that bit cooler than a plain old tin of soup. Campbell's thinks it is on to a winner due to the fact that 80% of people that buy Keurig pods apparently also buy Campbell's soup. One question that will undoubtedly be on the minds of prospective buyers is how it will taste and more to the point whether there will be a distinct coffee-esque aroma to the soup. I guess we'll find that out if these ever make it to Europe!